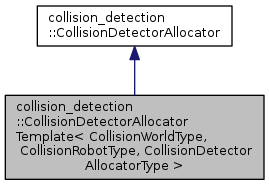 Template class to make it easy to create an allocator for a specific CollisionWorld/CollisionRobot pair. Definition at line 76 of file collision_detector_allocator.h. Definition at line 94 of file collision_detector_allocator.h. create a new CollisionRobot by copying an existing CollisionRobot of the same type. Definition at line 99 of file collision_detector_allocator.h. create a new CollisionWorld for checking collisions with the supplied world. Definition at line 84 of file collision_detector_allocator.h. create a new CollisionWorld by copying an existing CollisionWorld of the same type.s The world must be either the same world as used by or a copy of that world which has not yet been modified. Definition at line 89 of file collision_detector_allocator.h. Definition at line 105 of file collision_detector_allocator.h. A unique name identifying the CollisionWorld/CollisionRobot pairing. Definition at line 79 of file collision_detector_allocator.h.